The following is a guest article written by Jim Rollince of Gym Source, America's largest commercial provider of fitness equipment and a company that prides themselves on the values of exercise and health. Keep ambient light out of the room. Don't use alarm clocks that wake you abruptly. Get a fair amount of sunlight and/or be outside during the day. If all else fails, try a product like Tylenol sleep. Despite these good points, what doctors often don't explicitly mention is that improved sleep can be found through the simple enjoyment of life, and even more specifically, exercise! Most practitioners of fitness follow through with a simple, yet mundane routine that eventually leaves them feeling pretty bored with it. Boredom leads to restlessness; restlessness leads to increased brain activity prior to falling asleep. To sleep well at night it helps if your body and mind both feel as if they've accomplished something during the day--whether or not you're involved athletically, it helps if you remain active in one way or another. And through that activity, attempt to find enjoyment. And just because you like your job, or relationship, doesn't necessarily mean that you're satisfied with all other environmental factors. Most people do much more outside of work, including intramural sports, trivia, and in some cases, extra work! These are all great ways to stay active and eliminate the tirelessness that can plague your restless nights. Yet, be careful as to not overdo one or the other; as I mentioned previously, some people like to frequent the gym and follow the same workout regimen daily. This is great if you're entering into a weight-lifting competition, or you're a professional athlete, but for most people, it won't cut it in the long run. As human beings, we benefit from teaching our mind new things, while also teaching our body the same. This is inherently true with things like dance. More specifically, Zumba is an excellent example of something different, fun, and unique. The ability to genuinely enhance cardiovascular function and endurance, while practicing muscle memory routines effectively exercises the whole body. And simply put, it's fun! Undoubtedly, the most practical and enjoyable way to stay in shape is by playing intramural sports or engaging in a physically strenuous activity. Playing in an intramural dodge ball or kickball league can successfully burn fat and leave the body feeling accomplished. Even things like mountain climbing, biking, quad racing, fishing, golfing, etc. 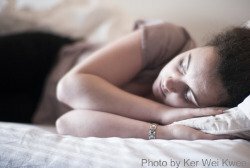 are all great ways to actively stay in shape, and by nature of doing so improve your sleep. By switching up your exercise load, you can easily diversify your every day routine, keeping things fresh, and keeping your mind and body in a healthier, less stressful state. Go out and diversify your exercise/health routine so as to not become burdened by what should ultimately be an enjoyable experience. You'll rest easier for it. Written by Jim Rollince of Gym Source, home of fitness gurus and an extremely reputable distributor of home gyms and training equipment, including treadmills, ellipticals, bikes, arc trainers and accessories.